Dan from Switzerland with a big snook! It was bound to happen sooner or later.. We got our first cold front of the year.. more like a cool front.. NE winds for 5 days lowered the humidity and cooled things down.. Not too cool.. low 80s for water and air temperature.. Actually turned the AC off in my apartment for a couple days.. The 20 mph wind made for some challenging fishing..
Fished the Dan and Dan team from Switzerland for 5 days in windy conditions.. We fished early and found tarpon rolling in some lees... Got some great surface eats on surface flies.. Got some shots at bones, caught jacks on fly.. and chummed in some big sharks that went for big orange flies.. Oh yeah... Dan got a huge snook on fly.. We have very few snook in the lower keys on the flats..
Glassy smooth this morning and we found lots of bonefish pushing and tailing... Easy to see them a long way away when it is calm.. down side it takes the right cast to get it to them with out spooking the bonefish... That makes it fun..
Now there is a permit! My friend Randy sent me this photo.. It was too good not to pass on.. Randy has been doing well on bonefish and permit.. 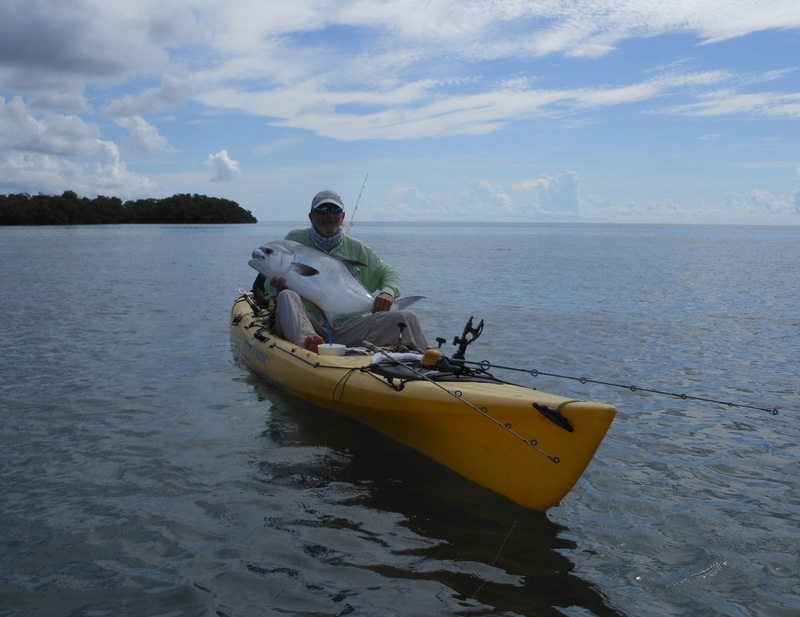 Fishing from a kayak takes special skills.. Most of all patience.. If it is not happening were you are fishing.. it not like you can start the motor and check out another spot 5 miles away.. Lodging prices drop this time of year.. Great time to be in the Florida Keys!